A startlingly good movie came out in Japan this year. It’s called “Uchu Kyodai,” or “Space Brothers,” directed by Yoshitaka Mori. I began watching it with modest expectations, but soon found myself utterly charmed and even moved. I actually shed a tear at one point. It’s about two brothers who make a childhood vow to become astronauts, but then follow different trajectories in adult life. Many years later, little brother Hibito (Masaki Okada) is still chasing that far-fetched dream while big brother Mutta (Shun Oguri) has settled on a more down-to-earth career designing cars. Objectively, Mutta has made the more realistic choice. He has what should be a rewarding job that calls on his intelligence and creativity. But even the best-laid plans can go awry. Mutta’s boss is a clueless old stuffed suit who fails to appreciate his underling’s work – and soon that underling is out of work. Meanwhile, Hibito has in fact become an astronaut and is living in Florida, where he is preparing for a NASA mission meant to lay the groundwork for human colonization of the moon. News coverage turns Hibito into a minor celebrity just as Mutta’s life is falling apart. But then, Mutta receives a letter from JAXA (the Japan Aerospace Exploration Agency) confirming his registration to take the qualifying exam for an astronaut training program. For Mutta, this is completely unexpected. Hibito had signed his brother up without telling him. At first Mutta is resentful. Then he realizes he has nothing better to do. Then he starts to get into the idea. So, he goes and takes the exam – but there are many more hurdles to clear before he can finally put on a spacesuit. I often make such jaded guesses while watching Hollywood blockbusters. The bigger the movie is, the likelier I am to be right. But “Space Brothers” is an admirably realistic movie. Mutta’s training still has a couple of years to go, and he will not be leaving Earth any time soon. Whatever Hibito’s fate on the moon may be, he’s going to face it alone. In a related difference from Hollywood convention, most of the film is about Mutta doing the work of preparing to become an astronaut. In most American movies these days, all of the hard work and study and testing and repetition and drudgery would be compressed into a brief montage to clear the way for the big action scenes. But hard work and preparation is a major part of what this movie is about. The only high-profile Hollywood picture I can think of offhand that has a similar focus is “An Officer and a Gentleman” – and that came out way back in 1982. Lots of movies have a “follow your dream” message. Fewer have a more meaningful “work for your dream” message. Does this mean that “Space Brothers” is an especially Japanese movie, or just an especially good movie? I’ll leave the first part of that question up in the air, but I’ll say yes to the second part. However, one way in which it is clearly a Japanese movie is that Mutta, as the older brother, feels he should be the one to take the lead in anything he and Hibito do together. This magnifies the degree to which Hibito’s success makes Mutta feel like a failure, and helps to explain Mutta’s reluctance to go into space at all. The film doesn’t beat you over the head with this theme, but it is something that both brothers are clearly aware of. 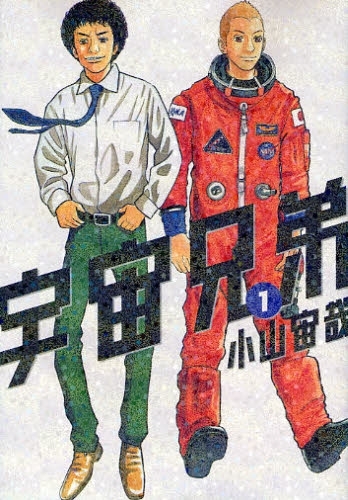 “Space Brothers” is based on a manga by Chuya Koyama, which has also been adapted as an anime. Another Japanese characteristic of the film is that in the small handful of scenes that take place in English, everyone speaks very slowly and almost flatly – including the white actors and black actors playing Americans, who are presumably native English speakers. Having seen this phenomenon before, I would guess there are two reasons for it. One might be that the foreign actors are trying not to speak faster than their Japanese counterparts. A more important reason might be that slowly delivered English is easier for Japanese moviegoers to comprehend as they draw on their half-remembered high school English lessons. This could put the film at a disadvantage if it is ever released in an English-speaking country. However, I hope it won’t be much of a disadvantage since an overwhelming majority of the dialog is in Japanese. The supporting characters are all very small roles, and most of them blend into the scenery. The main focus is on the relationship between the two brothers, who embody two approaches to life. Take big chances, like Hibito, and you may get yourself killed. Play it safe, like Mutta, and you may die of disappointment. We probably all have a little of both brothers inside of us. Which one is stronger in you? “Space Brothers” was released in Japan in May, and came out in Taiwan on Sept. 21. It will be released in Japan on DVD and Blu Ray in December. So why am I writing about it just now? I had that good fortune to watch it with English subtitles on transpacific flight earlier this month. (Thank you, American Airlines.) I’ll update this post as I learn about release dates in other countries. Until then, look for it on your next flight to or from Japan. As of Dec. 21, 2012, this movie is available on DVD and Blu Ray in Japan. You are currently browsing the Tokyo Tom Baker: The Blog blog archives for September, 2012.